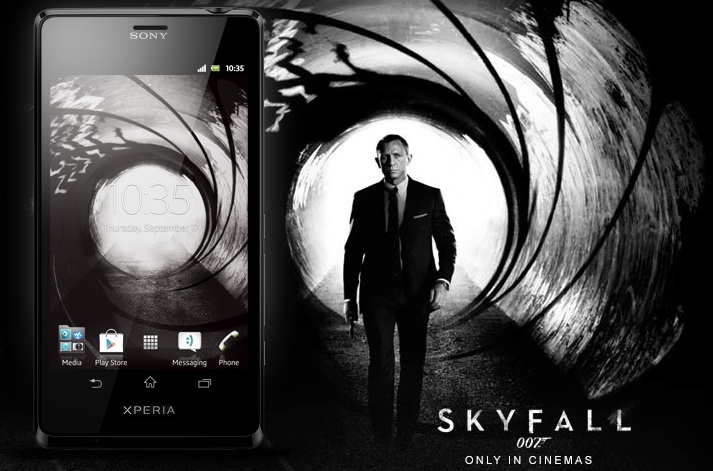 With Skyfall, the latest installment to the long-running James Bond franchise, just a few short days away, some of the super-spy’s fans may be happy to know that his phone, the Sony Xperia T, will be available in multiple territories by November. Today, we’ve got word that Canada is now confirmed to be included in that list. “Straight from the latest James Bond theatrical release Skyfall, Sony Mobile Communications announced today Xperia™ T – the Bond phone, the newest Sony smartphone which brings Sony’s best HD experiences, easy connectivity with ‘One-Touch’ sharing enabled by NFC (Near Field Communications) and Sony’s award-winning arc design, will launch in Canada with multiple carriers including Bell, Mobilicity, MTS, Rogers and Videotron this November. The Sony Xperia T comes with a 4.6-inch HD display at 1280 x 720 resolution, powered by Sony’s own amazingly brilliant Mobile BRAVIA engine. Under the sleek exterior is a 1.5 GHz dual core processor, Android 4.0 Ice Cream Sandwich and 16 GB internal storage. Planning to use the device for super secret spy engagements? You’ll be happy to know that it also comes with a 13 MP shooter that will help you capture every detail of your mission. No pricing details have been released as of yet for the Sony Xperia T or if other Canadian carriers aside from the five mentioned in the press release will also be getting the device. We’ll be sure to give you an update on these as soon as new information emerges. Any of our Canadian Tapscapers planning to get the Sony Xperia T? Sound off in the comments!